Hear a loud banging in your pipes? The culprit is likely water hammer. Here's how to stop the racket and save your pipes along the way. Q: When the water reaches the fill level in my washing machine and the agitation cycle starts, I always hear a loud series of bangs in the pipes behind the wall. What’s causing this? Will it harm the pipes? A: The banging racket you’re hearing is called “water hammer,” a form of hydraulic shock that occurs when the shut-off valve on a high-pressure water line suddenly closes. As your washing machine fills, water rushes quickly through the pipes in your home until—when the drum reaches capacity—the washer valve abruptly closes. With nowhere to go, the fast-moving water supply slams against the side of the pipe with an intense surge of pressure, causing the pipes to jerk and thud against wall framing or other pipes. As a result, you hear a loud series of bangs and maybe even feel the pressure shaking the house. More than just produce an annoying clamor, water hammer can actually damage the pipe connections and joints, resulting in leaks and costly repairs. Or worse, the noise may also indicate a larger problem like excessive pressure in your water supply lines or loose piping. Fortunately, homeowners can usually eliminate water hammer inexpensively without the help of a professional. Just follow the steps below to conduct your own investigation into the matter. Troubleshoot your air chamber. This vertical pipe located near the water valve helps alleviate water hammer by acting as a cushion. The air chamber absorbs the shock of the water once the valve closes, preventing the water from loudly slamming against the side of the pipes. Many homes have air chambers installed within their walls, but sometimes the air chamber can stop working properly if it becomes waterlogged. To fix the issue, homeowners need to drain their plumbing system: Shut off the main water valve, open the highest faucet in your home, and drain water from the lowest faucet (usually in the basement or first floor). The air chamber will fill back up with air instead of water, hopefully solving the water hammer problem. If your home doesn’t have an air chamber, consider having one installed by a professional. As an alternative, install water hammer arrestors to eliminate the banging. 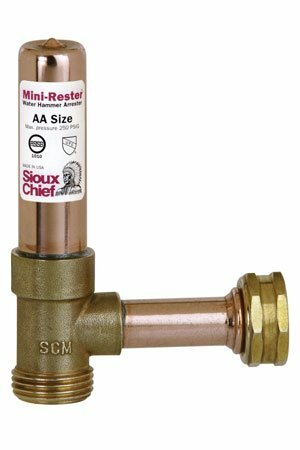 Water hammer arrestors feature air-filled cylinders that absorb the jolt of a sudden water pressure increase when a valve shuts off. Most water hammer arrestors available today are easy to install, and they feature screw-type connectors that attach between a water-supply line and a shut-off valve. Make sure to install two: one on the hot water supply line and one on the cold water supply line. 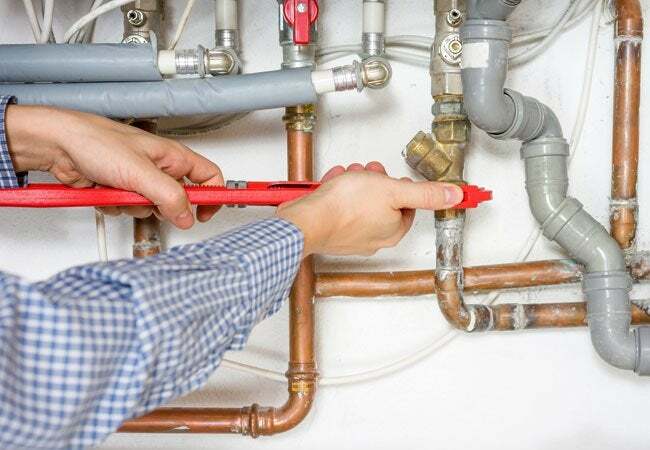 If you’re not familiar with basic plumbing connections, however, don’t hesitate to call a plumber to install the arrestors. Adjust the water pressure reduction valve. Sometimes, excessive water pressure in your pipes causes water hammer and so emptying the air chamber of water or installing a water arrestor offers only temporary help. To regulate the pressure, homeowners should adjust their pressure-reducing valve. These valves exist in most homes nowadays, often located at the entrance point of a home’s main water supply. Depending on the manufacturer, some valves have a handle for adjustment, while others require a wrench or screwdriver. Use the proper technique to adjust your valve to a setting below 50 PSI (pounds per square inch), which is a sufficient setting for most homes. As a bonus, reducing the water pressure in your home saves energy, promotes water conservation, and potentially prolongs the life of your automatic appliances (including pricier investments like washing machines, toilets, and dishwashers). Reduce excessive water pressure at the meter. If your home doesn’t have a pressure-reducing valve, consider asking the municipality that controls the water system in your community to check your home’s water pressure. Municipal water systems often maintain the water in their lines at pressures around 200 PSI, but residential water lines aren’t designed to safely accommodate that much pressure. The municipality will usually check your water pressure for free, and they can reduce it if necessary. Stabilize loose water-supply lines to prevent banging. During home construction, the plumber uses U-shaped pipe straps to fasten water-supply lines to wooden joists or studs with screws. If the straps aren’t tight enough—or if a few straps are missing—the pipes can knock around and create noise. To stop the banging, tighten loose pipe straps with a screwdriver, or install additional pipe straps for added stability. Most pipe straps are molded from thin metal or plastic, but you can also find padded pipe straps that offer additional vibration reduction. Keep in mind that homeowners should never use galvanized or steel straps on copper pipes, since the combination of materials causes electrolysis and plumbing leaks. Cushion water-supply lines with pipe insulation. Pipe insulation, available in foam tubes, is designed to fit around water supply lines to keep them from freezing. But they also work great for cushioning loose, banging pipes. The foam tubes come pre-slit from end to end, so all you need to do is run your finger down the slit to open the tube, then fit it over the water supply line. Foam pipe insulation sells in six-foot lengths and ranges from around $3 up to $8 per tube, depending on density.